USE WASTE GREASE FROM RESTAURANTS TO INCREASE YOUR DIGESTER GAS PRODUCTION! 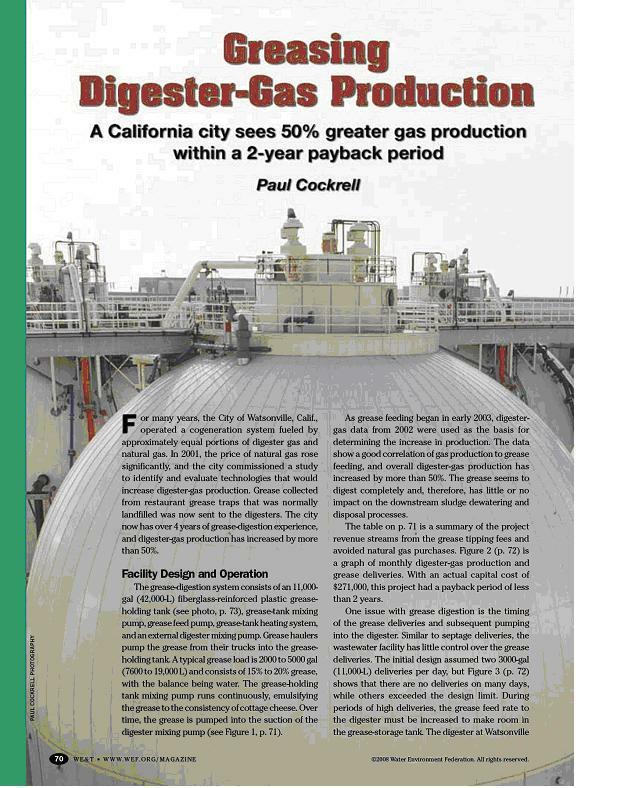 For many years, the City of Watsonville, Calif., operated a cogeneration system fueled by approximately equal portions of digester gas and natural gas. In 2001, the price of natural gas rose significantly, and the City commissioned a study to identify and evaluate technologies that would increase digester-gas production. Grease collected from restaurant grease traps that was normally landfilled was now sent to the digesters. The City now has over 4 years of gease-digestion experience, and digester-gas production has increased by more than 50%. To read the full article, click on link to WE&T website above right. MGSD recieved about $1.4 million in American Reinvestment and Recovery Act (ARRA) funds to build the cogeneration system. The new system went into operation late March 2011 and has already resulted in a significant electricity cost savings for MGSD. Gas is generated from the anaerobic digestion of brown grease that is supplied from area restaraunts. The new facilities at MGSD accommodate the reuse of restaraunt greas that previously was shipped to the Lockwood landfill. The grease is uniformly fed to the high capacity digester via a 10,000 gallon mixing tank. Over 80,000 cubic feet per day of natural gas that is created in the digester is then used a fuel source for a new 200 Kw generator. The electricity generated meets up to 80% of the power needs for the wastewater treatment plant which serves the Minden-Gardnerville area. Through savings in electricity costs, the project will pay for itself in about five years.